The all-seater Bet365 Stadium holds 28,383 supporters, although this has been reduced to 27,500 due to segregation. The main West stand consists of two tiers of seating which house 7,357 spectators, plus all of the Stadiums corporate and media facilities. The L-shaped Boothen and East stands hold 6,006 and 8,789 people respectively whilst The South Stand, used mainly for away support, holds 4,996. All 3 stands are on one level and offer fantastic views. Bet365 is one of the most trusted betting sites and since last April, Stoke City FC entered into an initial six-year stadium naming rights agreement with them. The name Bet365 Stadium took effect from June 1st, 2016. Visiting supporters are housed in the separate Big AM South Stand at one end of the ground, where up to 4,800 supporters can be accommodated. The views and leg room are excellent from all areas. The concourse is adequate and there is a large selection of refreshments available. 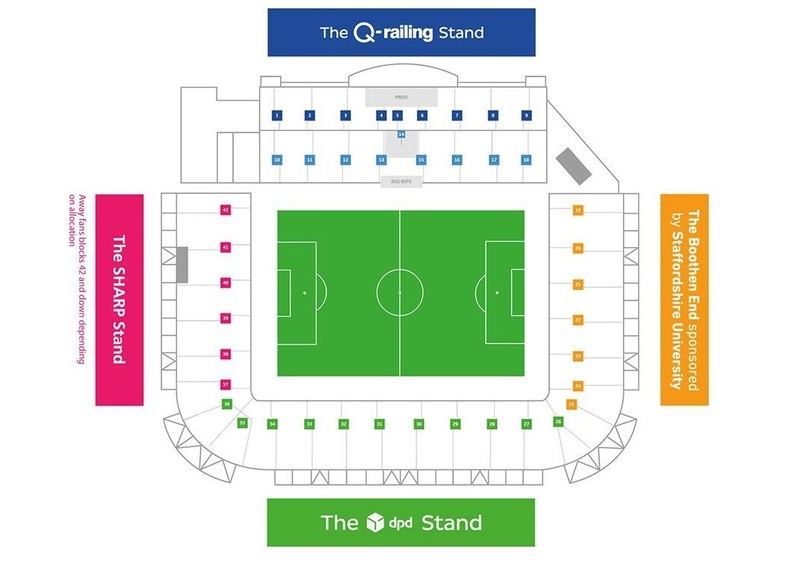 For any derby games or matches expecting trouble there is a sectioned off area to keep home and away fans apart. There are very few pubs in the local vicinity but a recommended one is The Poachers Cottage which is located on the on A34 (Trentham ) and is approximately ¼ mile from the official club car park entrance. It's best to keep club colours covered around the stadium including in the local bars and even the town centre. Another option which is close to the ground is the Power League complex that also has a bar and allows away fans in. On top of that, it shows Sky sports and you can park your car there for £4.50. It's situated to the south of the stadium just of Sir Stanley Matthews Way. Parking is available in the South stand car park at a cost of £5. Tickets must be purchased in advance from the Bet365 Stadium ticket office. You will need to keep your ticket in view as you enter and throughout the duration of the match. The South car park can be accessed from Trentham Road or from the A50 and the main slip road into the Stadium. The nearest / closest train station to Stoke City's Bet365 Stadium is Stoke-on-Trent. The station is on the main line from Manchester to London and also has major links to Birmingham, Crewe and Derby. Supporters arriving by train on match day can take a two-minute walk to Glebe Street in Stoke where buses run to the stadium at regular intervals. Turn right out of the station and take the next right to go under the bridge. Follow the road to the end and turn left, down a bank and into Glebe Street. Buses depart on the left hand side of the church. Travel: Other than a brief panic where the road layout has changed and my SatNav’s inability to realise this made me miss my turning, easy. About 5 minutes off the motorway, and easy to get to. Ended up at the Harvester right next to the ground for a fiver. That was fine, but getting out was a bit of a nightmare. Refreshments: Not a lot, but the presence of the Harvester makes it a big step up from Reading and Bolton on it’s own! We also went in the bar at a Soccer League place one time too, but last time I went it was home fans only. Impressions: I like the fact the corners are open, and it’s built in a little valley, made it far more interesting than most newer grounds. Inside was a bit small, but the fact they sold drinks in bottles meant the queues were non existent, which was good. View from the away end was good…unless you were on row 3 and had most of your view blocked by a moving camera or Tim Howard’s back like I did on my first visit! Atmosphere: One of the better ones in the Premier League. Delilah is always good, and there was some really good banter on my most recent visit following Stoke’s now infamous ‘Doing the Wenger’ which brought some laughs! Anything Else: Fun with ball boys! We led 2-0 and Stoke pulled one back. About 5 minutes after, Fuller scored an equaliser, only to have it disallowed for a foul. The ball boy in front of the away end took the opportunity to goad us, only to feel a right berk when he realised it had been disallowed and we were now goading him! When Stoke did eventually equalise, he’'d already had a ticking off from a steward so didn't bother gloating this time! Enjoy: Not that bad, as far as new grounds go. Have you been to Stoke City's Bet365 Stadium? To tell us about your experiences and to feature on the site, simply complete the fans review form below!